Whenever you are checking your Hotmail emails, you can use your browser's Print command to print the current page: there is a better way to print your Hotmail emails, however: this tutorial will show you Windows Live Hotmail's built-in command to print your emails in a printer-friendly format. Printing an email using the web browser's Print command will print the entire page, not just the selected email; on the other hand, Hotmail's print command will only print the current email, and reformat it as needed for a better print output (or PDF, if you are printing the email to Acrobat's PDF print driver). This tutorial explains how to print emails while logged into Hotmail in a web browser like Internet Explorer - to print Hotmail messages from an email program like Windows Live Mail, you can simply use the application's built-in Print command (usually located under File > Print). As shown in the screenshot above, moving your mouse over the Print button displays a tooltip that reads " Print (Ctrl+Shift+P) " - the keystroke is the keys you need to hold simultaneously to print a Hotmail email without using the mouse (learn more about Hotmail keyboard shortcuts). Tip: in the new Hotmail, you can also print an email by opening the message, and clicking "Print message" under the new Action menu. If the "Windows Live Hotmail Print Message" window that opened does not automatically close after you have printed your email, simply click the Close link displayed in the top right corner to return to Hotmail's main window and emails. To print one of your Hotmail emails while another email is currently opened, simply right-click on the email you want to print: this will open the email's "context menu", which contains common commands. Locate and click on the Print menu item near the bottom to launch the Hotmail printer-friendly email window we just covered. 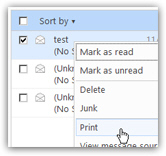 In the next section of this tutorial, we will now cover the absent multiple-email-printing feature in Hotmail, and explain how to work around it to quickly print multiple emails. It is very natural to expect the ability to print several emails at the same time in Hotmail: unfortunately, that particular feature has not yet been implemented by the Windows Live team (the group at Microsoft that maintains and updates the Hotmail webmail service). 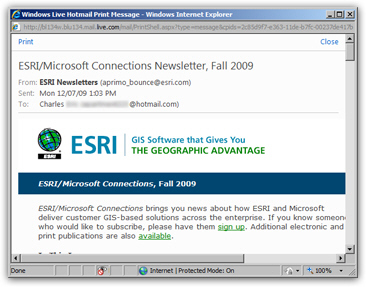 Notice that if you select multiple emails using their respective checkbox, and then right-click on the selected emails, the Print command is no longer showing in the context menu: this is not a bug or problem with your browser - it simply means that Hotmail does not allow at this time to queue and print multiple emails simultaneously. So, to print multiple Hotmail emails, you will need to print one at a time: the fastest way to do that is to use the right-click-to-print method: not only are you saving time by not having to wait for the email to open before you can print it, but it also requires less cursor-moving around the screen (the Print command is always a few pixels below your right-click spot). The fastest way to print the selected email will be to use Windows Live Hotmail's email printing keyboard shortcut, which is Ctrl+Shift+P.